technology can greatly assist teachers in individualizing instruction. Focus on supporting the teacher in the classroom. We can all point to many culprits for why children do not learn (parents, schools, society, lack of after-school programs, etc) but in the end of the day it is the teacher in the classroom that should have the primary responsibility for educating the students, and all efforts should revolve around supporting the teacher. Furthermore, all of us technologists would be greatly served by humility about the potential of technology. Artificial intelligence is getting ever more powerful, but it still pales in comparison to human intelligence, empathy and creativity. 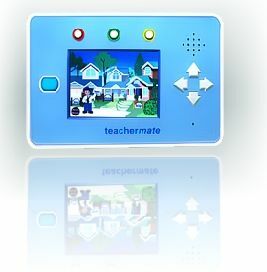 Our TeacherMate handheld computer system is designed to support the teacher. Even the name itself was chosen purposefully. Although the handheld devices are used by students, the units are just one component of a larger system to support teachers. We have made the effort to analyze the scope and sequence of all of the major reading and math basals, which allows teachers to easily coordinate activities on the TeacherMates to their paper-based curriculum. This should be the educational technologists credo akin to doctors “do no harm”. The failure of almost all educational technology initiatives can usually be traced to the additional burden placed on the teacher. Ideally, teachers’ burdens should be reduced by technology. We believe we have achieved this not by one bold move, but rather by attention to a myriad of details. The art of a learning management system is to provide advanced users with powerful options and customizability, while offering a neophyte user a clean and simple interface. Synching of devices needs to be automatic. And since all technology fails at various times, a system of workarounds that do not interrupt a teacher’s instruction is critical to success. Multiply anything by the number of students needed to be served, and costs soar quickly. We would be delighted to add a touch screen to our device, but we can create effective technology without it that enables more students to be served with the same budget. Avoid reliance on major grants. Governmental, foundation and other grants are manna from heaven, but you can’t rely on them to scale a sustainable project. Given the myriad of failures of ICT in education, it is imperative to do one thing well first, and then build on success. We are focused on K-2 basic education. And after twenty years, we still don’t have even this licked, imagine that. Written by Seth Weinberger on June 15, 2010 in Low-Cost ICT Devices. What is the license for the education content on the teachermate? It looks like one of the best and most cost effect products currently available. I would like to see about making the content available on other hardware platforms? We are currently porting all of our software to the iOS platform for the iPod, iPad and iPhone devices. We will port to other platforms (including Android) as soon as there are sufficient numbers of devices of that platform in schools. Do you really see the iPad and iPod Touch as gaining that much traction in schools? And curiously, Android still that far behind. If so, do you see them as school-purchased equipment – like Teachermate – or will this be a student owned device, maybe even bought by the student independent of the school? If you envision the student buying the device, that represents a big long-term shift in the way learning materials reach the students and many the first ICT learning device that students can afford and do buy independent of schools. For all the hype around mobile phones potential in the classroom, your efforts may be the first to integrate them in the curriculum. I believe we are going to see a tsunami of iPads and iPod Touches in the schools. At this moment there are few Android non-phone alternatives, but that will change next year. Many parents will purchase these devices for their students, even as young as 3-4 years old. However, in order for these to play a central role in instruction, the school needs to be the purchaser to ensure that all students have equal access, and to ensure consistency of platform and functions. Is there a deployment in developing nation, for example, Kenya (where we have been two times taking One Laptop Per Child)? Ours now has a hundred units in a Primary School in Eastern Province. Through our relationship with Stanford University we have small demonstration pilots in a number of places in the developing world. We will commence a more substantial pilot in collaboration with Open Learning Exchange in Rwanda and Mexico this year. I'm really impressed by your focus on the teacher. I completely agree with your "Add No Burden" mantra – it pains me to see all these great ICT4E initiatives that assume teachers have an extra 1-3 hours per day to fiddle with settings and code to make technology work int he classroom. And thanks for focusing on the teacher – even in the name of the solution. Too often, ICT4E is all about the students, and neglects any aspect of student management (assessment, personalized study, etc) that's actively fed back to the teacher. In fact, that last point suggests that ICT4E solutions lay in software, not hardware. It is heartening to see the support for teachers while on the subject of student learning. With all these wonderful tools, we often forget that it is the teacher who has to impart the instruction, whether through 'chalk and talk', a tried and tested OHP or a laptop. And the one thing that teachers world wide struggle with is the lack of time.